Fundraising has always been something of a black box. High-flying companies make it seem like a breeze, but most entrepreneurs lose sleep over it. My first startup was called Pursuit.com and although we successfully raised a seed round, it was incredibly tough (we were eventually aqui-hired by Facebook). DocSend is my second startup, and it has taught me a lot about the process — not only because of our own fundraising, but because the product itself reveals big pitching trends in a unique way. Since 2014, over 100,000 users have shared over 2.2 million links through our document tracking and sharing platform, and these documents have received over 220 million views. Thousands of founders share their funding decks with prospective investors every day, in addition to our product’s other uses for sales, business development and customer success. To get insights about all this activity, we have a long-running partnership with Harvard Business School, where we’ve been analyzing the anonymized fundraising data of startups attempting to raise a Seed or an A round. We shared our early learnings in a TechCrunch article in 2015, Lessons from a study of perfect pitch decks. In this post, I’ll update our findings based on the last four years of data (and a lot of user growth on our side). So what differentiates a winning seed round pitch deck from those that fail to raise capital? While both successful and failed pitch decks are about the same length, an average of 18 pages, how the content is structured is vastly different. And while investors spend the same amount of time on both, 3.7 minutes on average, where they spend time tells us a lot about what successful pitches and failed pitches have in common. Below, I detail three mistakes that you want to avoid. If you want to check out more details on what you should do in your deck, read my follow-up article “Data tells us that investors love a good story“ over on Extra Crunch. It’s very tempting, especially for technical founders, to start pitch decks with how incredible their product is, how much time they’ve spent building it, their unique tech stack, and how convinced they are that they have just the right MVP for launch. But guess what? All failed pitch decks start with the product. Investors spend 4x more time on product slides in failed pitch decks than they do in successful pitch decks. You might think that’s a good thing. More time on my product slides, right? No. Data tells us that they are probably digging into the details trying to map your product‘s value to the current market needs and they are not coming away with a clear connection between the two. Your target investors are also not your target customer. Showing screenshots and product details are just confusing for them. What are they looking at? Why does this matter? Most products are capable of being built; the question they are trying to answer is why is this product going to create a big business? By now Simon Sinek has beaten this one into our collective brains with his start with the why Ted Talk and yet what we see in our data is that in failed decks, the “why now” and “why you” question has been left to the end. Successful pitches start with their company purpose, followed by why this team, and why the timing is right for this particular product. All successful pitch decks start with the company’s purpose, their raison d’être. 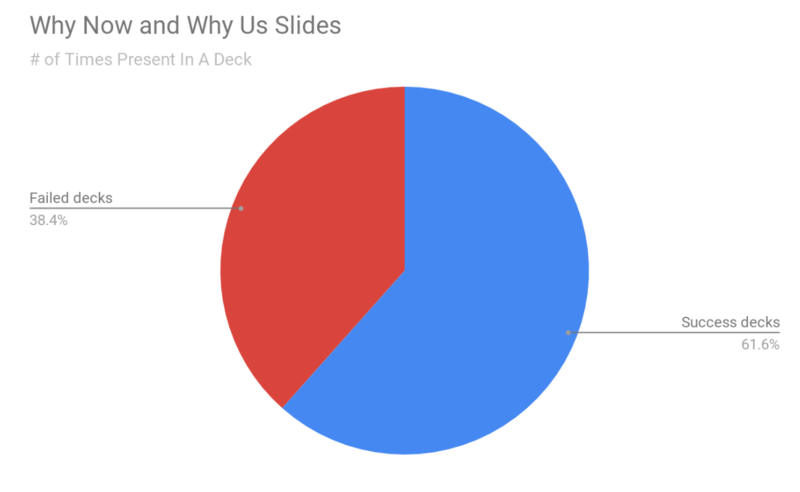 In successful decks, investors spend 27 seconds on an average on “why now” and “why you” slides but in failed decks, they spend 62 seconds on these slides. We read this as investors are spending more time researching your team and your capabilities than they do with successful pitch decks. More time spent on these pages means that investors are not as convinced about this venture as the entrepreneur would like them to be. Entrepreneurs should focus on making their “why” slides part of a seamless narrative that leaves the investors wondering why this isn’t already a huge business. Everyone loves a good story and investors are no exception to this rule. All successful pitch decks tell a compelling story and follow a similar narrative thread. They start with the company purpose, the big problem they are trying to solve, why now is the right time, and why they are the right team to solve it. Failed pitch decks start with the product, followed by business model, and competitive landscape. Successful decks cover these too but they invariably follow a narrative that makes intuitive sense while in failed decks there is no compelling narrative. In failed decks, investors spend more time on product, team, and financials, 6 minutes on average, vs. 2 minutes in successful decks. 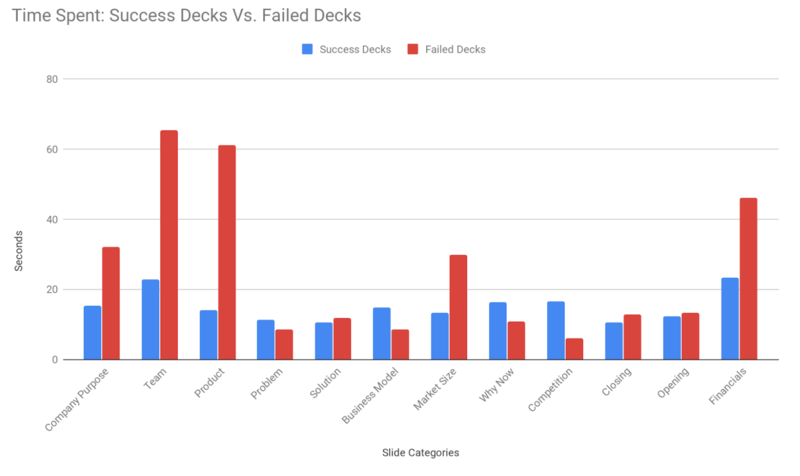 Successful decks also get more repeat visits, they are visited 2.3 times more than failed decks and are forwarded along more often than failed pitch decks. In the early days, entrepreneurs spend most of their time conceiving and building their minimum viable product (MVP). Naturally, they feel compelled to pitch this to investors. Although unintuitive, data suggests that you should restrain yourself from talking about your product before you have painted a narrative about the business opportunity: why now and why you. Once investors are convinced of those key points, by all means, go through all the product details and roadmaps. Just don’t lead with your product. This is the first of a series of articles about fundraising. 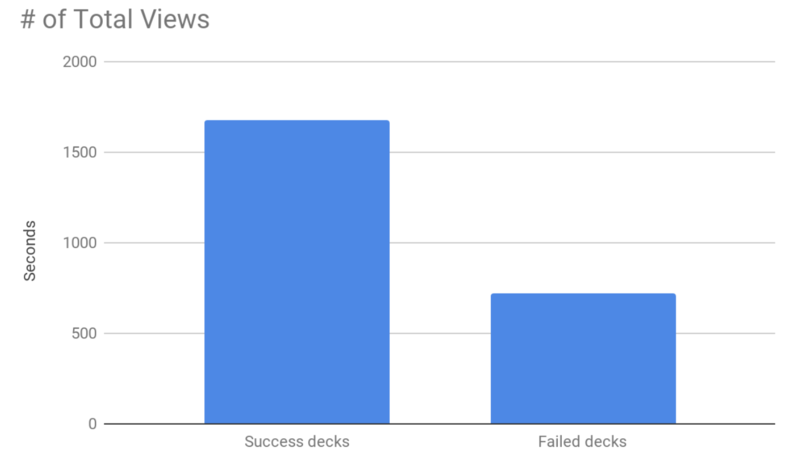 My followup article now available on Extra Crunch reveals what our data shows you should do with your deck. In future installments, I’ll be sharing more about the difference between Seed, Series A, and Series B rounds as well as how fundraising challenges change as your company grows. For the next post, I’ll be writing about why some pitch decks raise way more money than others. In the meantime, have questions about the best way to raise money? Check out our blog or reach out to us on Twitter at: @rheddleston or @docsend.